Dragondeer, a heavy blues American rock band from Denver, CO, is gathering quite a bit of esteem for their newest album, and first full length LP, If You Got The Blues. Sighted for their singularity and strangeness, this Denver band is doing something different, and has us all turning our heads and our hips. 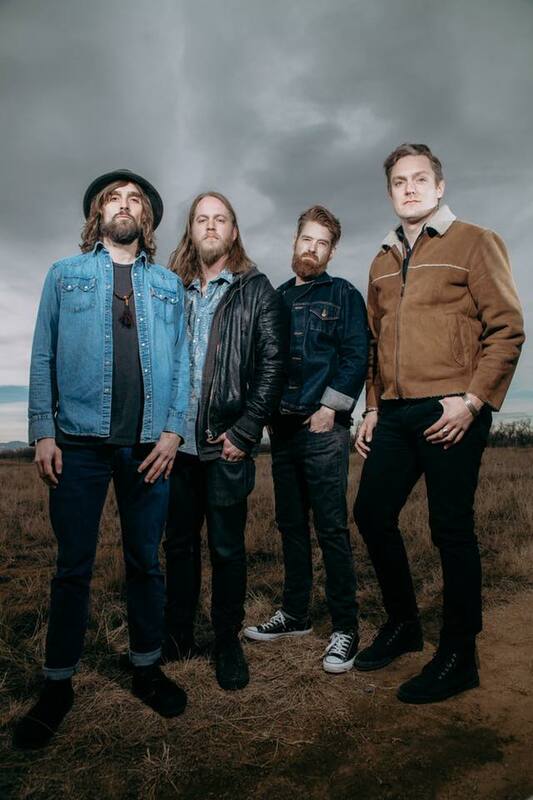 They draw inspiration from all angles of the American sound including the soul and sincerity of the electric blues of Stevie Ray Vaughn, the modern-day dread of The Black Keys, a bit of pre-heavy metal influence from Black Sabbath, and the swamp rock of Creedence Clearwater Revival. These influences have helped Dragondeer claim a first-class seat on Jefferson’s airplane, as it takes off into the future of American rock music, and pays homage to all the artists that set the runway for this band to jet. The members of the band include Cole Rudy (electric guitar/lap steel/mandolin), Eric Halborg (lead vocals/harmonica/guitar), Carl Sorensen (drums), and Casey Sidwell (bass). The album begins with the self-titled track, “If You Got the Blues,” setting the stage for the sincerity and soul that occurs throughout the journey of this production. A production, I might add, that couldn’t have happened without the help of accomplished producer Mark Howard, who has worked with legendary artists such as Bob Dylan, Tom Waits, REM, Neil Young, Lucinda Williams, and Willie Nelson. The album saunters us in with the ethereal notes of Eric Halborg’s voice merging magically with the harmonica, as it soars over the chortling cuts of low-end accompaniment in this psychedelic Americana ballad. “Don’t Go” pleads the song’s opening line, and from the moment the words first burst forth from his lips, the pure longing in his voice lends credence to the name of this track, and the entire project. The discordant harmonies of the chorus resolve into a melancholic, distorted fuzz, leaving us reminiscent of dusty guitars plucked by the firelight, and amplified by the neon lens of modern reality. The second chorus cuts with a solemn breakdown, drifting off into the chasm of our isolation. Both the lyrics and the voicing of the instrumentation echo our worst fear of being truly alone; listening to these tunesmiths, it’s as if our entire psyche has been cloaked in an iridescent haze of the weirder parts of the 1970s. A bold and beautiful love song, this first track stands as a testament to Dragondeer’s songwriting, musicianship, and purity. The band describes the track as a personal manifesto, with inspiration drawn from the belief in a shared human experience and a desire to connect with others. The next track, “Amarillo Bump,” begins with the sustained sounds of Rudy’s electric guitar, leaving us suspended in time only to be saved by Halborg’s harmonica once again. We are then escorted into the thumping and driving kick of Carl Sorensen’s drum beat, which becomes the outboard motor for the entire track, propelling us into the murky waters of the 1950s and out into the swampy southern rock of the 70s. Like a bunch of Scottish teenagers out for a boating holiday on Loch Ness dropping acid before hearing thumps at the bottom of the boat, the electric guitar and harmonica attempt musical cries for aid, calling until their voices grow raspy, realizing that there is no help coming. And so, we lay back and accept our fate, letting the bass tones and percussive rhythms of writhing tentacles and electronica bring us deeper and deeper into the darkness. The album continues with Halborg’s raw vocals, rambling harmonica solos, and groovy instrumentation that fuse all together into a unique genre of country funk and American rock. Like taking a long swamp ride along the rolling waves of the Florida everglades, brought up and turned on by the slow, isolating tracks like “Believe,” “Easy With Me,” and “When I See You,” and then brought back down into slow, isolating tracks like “Same Train,” “Let it Ride,” and “Part of the Flow.” This vacillating progression, capturing the beautiful desperation of blues music. Alone, If You Got The Blues stands as a declaration of the band’s genius, but their live performance brings an entirely alternate layer of talent, captivating the audience with their impressive improvisation, harmonizing harmonica, heavy metal mandolin, lap steel played untraditionally through delays, and a ripping rhythm section that can’t keep us from getting down and dancing. You can see Dragondeer perform their new album live at The Grandoozy Festival this summer in Denver, CO on September 14th. The band is stoked to be coming back to their hometown to perform alongside a variety of internationally renowned artists of all different genres. Be sure to follow Dragondeer on Spotify and iTunes and keep a look out for all of their other upcoming shows in Atlanta, Telluride, and right here in their hometown of Denver. You can buy tickets for Grandoozy here!